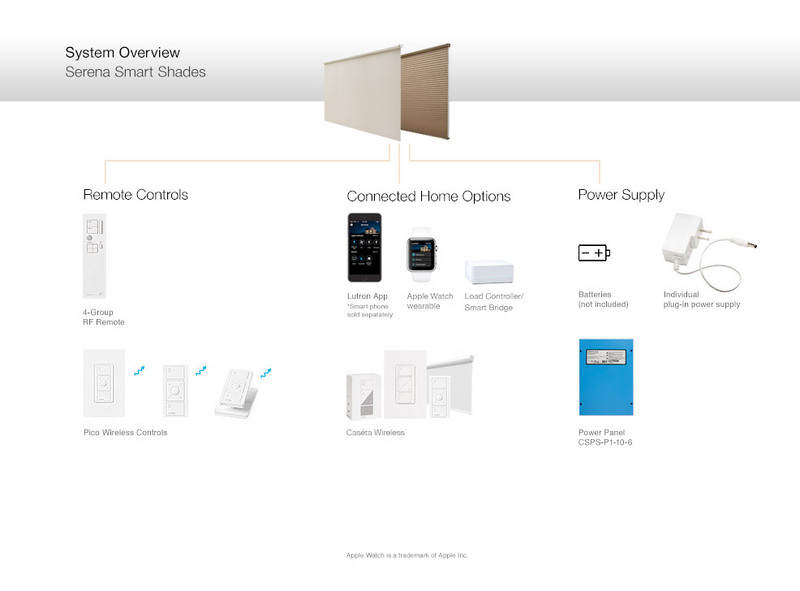 The diagram above provides an overview of the components that constitute the Serena Smart shading system, as well as compatible Lutron products. You can refer to the categorized list below to find a complete list of components with more detail about select products. Serena Shades can be controlled from anywhere in the room using a Lutron Radio Frequency Remote Control. With the Smart Bridge from Lutron, you can control Serena shades from anywhere in the world using the free Lutron App on a mobile device. Caseta Wireless dimmers can be included to create a complete automation experience. The Pico wireless control can function as a stylish tabletop control or it can be wireless mounted to a wall using the Claro Wallplate and Pico Adapter.